Benedictine Father Cyprian Davis, a monk of Saint Meinrad Archabbey in St. Meinrad, died on May 18 at Memorial Hospital in Jasper, Ind. He was 84. The Mass of Christian Burial was to be celebrated on May 21 at the Archabbey Church of Our Lady of Einsiedeln in St. Meinrad. Burial was to follow at the Archabbey Cemetery. Father Cyprian was a jubilarian of both monastic profession and ordination. He had lived as a monk for 63 years and as a priest for 59 years. In the broader Church, Father Cyprian was acknowledged as the foremost historian of black Catholics in the United States. In 1990, he published what is considered the definitive book on the topic, The History of Black Catholics in the United States. Father Kenneth Taylor, pastor of Holy Angels and St. Rita parishes, both in Indianapolis, and president of the National Black Catholic Clergy Caucus (NBCCC), was at a meeting of the NBCCC in Montgomery, Ala., when he learned of Father Cyprian’s death. Father Cyprian was a founding member of the organization at its establishment in 1968 in the wake of the riots that followed the assassination of Dr. Martin Luther King, Jr.
“He is the foundation stone for the development of black Catholic history,” Father Taylor said. “Covering that history that a lot of people—black, white or anybody in the Church—were just not aware of led to the development of all kinds of other disciplines, like theology and liturgy from a black Catholic perspective. Part of that development, Father Taylor said, was the way in which Father Cyprian helped black Catholics in the U.S. understand their importance in the Church in this country across history. In a statement released after the monk’s death, Archbishop Joseph E. Kurtz of Louisville, Ky., president of the U.S. Conference of Catholic Bishops, recognized Father Cyprian’s significance to the Church in this country, but also the depth of his life of faith. “Father Cyprian Davis was a significant leader as a Benedictine monk and priest of Saint Meinrad Archabbey and as a spiritual writer, historian, and advocate for the vibrant presence of African American Catholic leaders,” Archbishop Kurtz said. “His 1990 book, The History of Black Catholics in the United States, remains the authoritative work in this important movement of Catholicism in the United States. 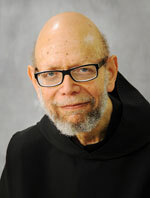 Although Father Cyprian’s influence on the black Catholic community in the U.S. over the past half century was enormous, Benedictine Archabbot Justin DuVall said that Father Cyprian’s identity was always rooted in his vocation to monastic life. He also noted that Father Cyprian, whom he described as a “great storyteller,” had a great influence on generations of priests, having taught at Saint Meinrad for nearly 50 years, starting in 1963. Archabbot Justin’s appreciation of Father Cyprian’s witness goes back nearly 40 years to the time when he had Father Cyprian as a professor in seminary. And it extends to the present because Father Cyprian was the priest to whom he went to confession. “He often was able to bring words of consolation and support to me in the sacrament that, I think, were based upon his own faithful search for God in this community,” Archabbot Justin said. Clarence John Davis was born in Washington, D.C., on Sept. 9, 1930. After entering the full communion of the Church as a youth, Father Cyprian received priestly formation at Saint Meinrad from 1949-56. Father Cyprian earned a licentiate in sacred theology from The Catholic University of America in Washington in 1957 and a licentiate and doctorate in historical sciences from the Catholic University of Louvain in Louvain, Belgium, respectively in 1963 and 1970. In the 1960s, he participated in the Civil Rights Movement, taking part in the March on Selma, Ala., in 1965. He served as archivist of Saint Meinrad Archabbey, the Swiss-American Benedictine Congregation and of the NBCCC. In addition to dozens of articles, book chapters and encyclopedia and dictionary entries, Father Cyprian wrote six books. An updated edition of his The History of Black Catholics in the United States will be published this summer. Father Cyprian assisted in the drafting of “Brothers and Sisters to Us,” the 1979 pastoral letter on racism published by the U.S. Conference of Catholic Bishops, and “What We Have Seen and Heard,” a 1984 pastoral letter on evangelization from black Catholic bishops in the U.S.